New Delhi: A classical event in the memory of Late Pt. Niranjan Prasad was organised yesterday at Indian Habitat Centre, New Delhi. Various performances by the disciples of Padma Vibhushan Awardees were held at the ceremony. Renowned Tabla player Amjad Khan and Flutist Saurabh Banaudha performed one of their best performances as a tribute to renowned Flutist Late Pt. Niranjan Prasad. Performances by the disciples of Padma Vibhushan Awardees for Bharatanatyam were highly appreciated by audience. Bharatanatyam,also historically called Sadir, is a major genre of Indian Classical Dance that originated in Tamil Nadu. Traditionally, Bharatanatyam has been a solo dance that was performed exclusively by women, and it expressed South Indian religious themes and spiritual ideas, particularly of Shaivism, Vaishnavism and Shaktism. Bharatanatyam’s theoretical foundations trace to the ancient Sanskrit text by Bharata Muni, Natya Shastra, its existence by 2nd century CE is noted in the ancient Tamil epic Silappatikaram, while temple sculptures of 6th to 9th century CE suggest it was a well refined performance art by mid 1st millennium CE. Bharatanatyam may be the oldest classical dance tradition of India. Bharatanatyam style is noted for its fixed upper torso, legs bent or knees flexed out combined with spectacular footwork, a sophisticated vocabulary of sign language based on gestures of hands, eyes and face muscles. The dance is accompanied by music and a singer, and typically her guru is present as the director and conductor of the performance and art. 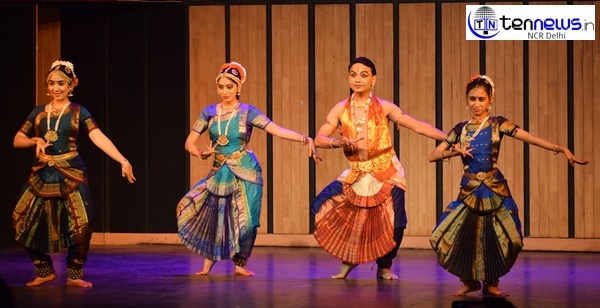 The dance has traditionally been a form of an interpretive narration of mythical legends and spiritual ideas from the Hindu texts.The performance repertoire of Bharatanatyam, like other classical dances, includes nrita, nritya and natya . Ryanities on a mission for an Eco friendly festival of Lights.